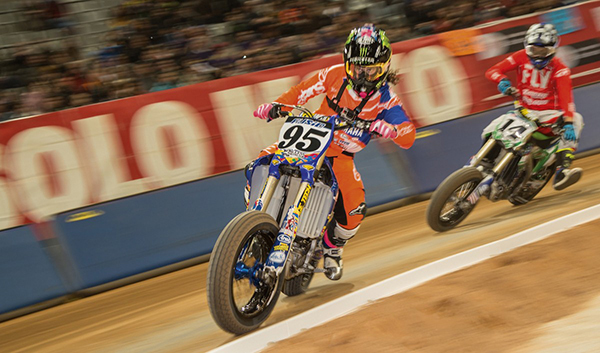 Superprestigio racing hit the short track at Palau Sant Jordi, Barcelona on December 16 with American J.D. Beach (No. 95 Ausio/Grau Racing Yamaha YZ450F) taking the win from fellow American Flat Track racer Briar Bauman, second (No. 14 Zanotti Kawasaki KX450F), with Spanish American Flat Track Series Champion Ferran Cardus (No. 77 Team Grau Suzuki RM-Z450) third. Next up for the stars of American Flat Track is the Bigger, Faster and Better DAYTONA TT on March 15, 2018, at Daytona International Speedway.